The office of a shipping merchant is represented on the second floor of the Mystic Bank. In the larger seaports, some merchants specialized in operating ships. They owned or chartered (rented) the vessels they operated, which either ran on a regular route between ports or else “tramped” around the oceans, carrying whatever cargo was available to wherever it had to go. Sometimes they purchased cargoes to ship, hoping to make a profit on their sale in another port. Otherwise, they sold space in their ships and collected freight money from the shippers based on the weight or volume of each owner’s part of the cargo. As immigration increased, some merchants specialized in shipping passengers. At New York in 1818, former British merchant Jeremiah Thompson pioneered the concept of the sailing packet, which was guaranteed to sail on schedule rather than waiting until its hold was full. Offering predictable service, his Black Ball Line revolutionized transatlantic trade, and many packet lines were established. Reliable steamships began to compete with the sailing packets in the 1840s, but the Black Ball Line remained in operation until 1876. This exhibit represents the firm operated by Jeremiah Thompson’s relative Samuel Thompson, in partnership with John W. Mason. From their office on Duane Street in New York, they imported and exported all sorts of goods, but through the 1850s much of their business was in passengers. Each of their large, fine ships could carry several hundred immigrants in basic conditions. These immigrants usually traveled safely and in good health, but when the firm’s new ship Caleb Grimshaw burned in 1849, more than 100 passengers were lost. The contents of this exhibit were donated in 1966 by Wendell P. Colton Jr., in memory of Anne Mason Colton. The large, two-sided partners’ desk made efficient use of space. The desk organizer in the corner held the records of the firm’s different vessels, while the letter press in another corner was used to make copies of business correspondence by pressing the letters to leave an ink impression on tissue paper. 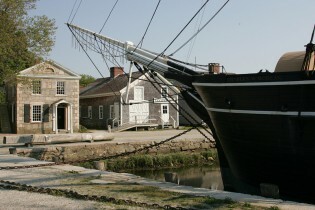 The Mystic Bank (left) and the Cooperage (right) behind the looming CHARLES W. MORGAN at Chubb’s Wharf.